Source of the Water Supply for Philadelphia. Thanks to Torben Jenk for bringing this article to my attention. When the founder of Pennsylvania selected the site for his capital, "named Philadelphia before she was born," on the banks of two broad rivers, whose waters rolled by pure and sweet, like their sources in the far distant mountains, on their way to the sea,-whatever hopes and fears may have exercised his mind concerning her destiny, no apprehensions disturbed him that she would not, for all time, be abundantly supplied with that primary want of human life-water. But the development of industries, and the growth of population, within and without her limits-the very agents which made her great and for a long time the first city in America--soon destroyed the purity and wholesomeness of those streams, and the one which flows through the very heart of the city-the Schuylkill--became foul and freighted with the germs of zymotic diseases. Yet from this source the chief water supply for Philadelphia is derived, although generally known that for many years it has been unfit for human consumption. It became, therefore, very natural to look to one or more of the Schuylkill's tributaries for a purer supply. Of these, the Perkiomen creek by proximity and volume seemed the most available. As early as 1865 Mr. Henry P. M. Birkinbine, then chief engineer of the Philadelphia water department, spent the greater part of that summer in the upper Perkiomen valley, with headquarters at Zieglerville, taking observations as to the flow of the Perkiomen creek; noting the rainfall; taking the topography around Zieglerville-the site of the proposed reservoir- and ascertaining the extent of country drained by the Perkiomen creek and its tributaries; also taking into consideration that the land submerged was not very valuable for agricultural purposes; the geological formation such that the water in the reservoir would not easily sink into the ground; moreover, [PAGE 10] the surrounding hills would be high enough to catch the first rainfall from the clouds as they moved westward from the Atlantic. From these hasty and altogether inadequate observations Mr. Birkinbine developed the scheme of impounding the Perkiomen creek immediately below its confluence with the Swamp creek, at what is now called Zieglerville station, on the Perkiomen railroad. Here is a very curious formation. The hills rise abruptly on each side of the creek and extend for miles alongside up these streams, thus forming a very advantageous locality for storing water. A dam built across the Perkiomen here would convert into an artificial lake what was very probably a natural one in prehistoric times-before the water had worn a gap through these hills.The proposed dam was to be sixty-five (65) feet high; it would submerge several hundred acres of land and hold an immense volume of water. In form it would be a straggling lake, with arms extending a few miles up the Perkiomen, the Goshenhoppen, the Society and Swamp creeks. In preparing the place every tree and stump was to be removed from its bottom, a wall was to surround it so that the edge of it would nowhere be less than four feet deep, the banks on its borders to be sodded, and a strong high fence to inclose all. It was estimated that this reservoir would hold enough water to supply the city for three months if not another drop would find its way into it; although another storage dam was to be built at Green Lane, which would hold almost as much, from which the water should be drawn to keep the one at Zieglerville constantly full.An underground conduit should conduct the water by gravity to high reservoirs near the city for distribution. Such was in brief Mr. Birkinbine's plan to supply Philadelphia with water. He thoroughly believed in it and advocated it very strongly, but the plan was not approved by the people of Philadelphia, the public press condemned it, calling the creek "Muddy Perkiomen" and claiming that it would not furnish enough water. But the scheme was never entirely abandoned, successive engineers in casting about for a purer supply always cast a wistful eye to the Perkiomen valley. Nothing, however, was attempted in this direction until the excellent suggestion by Mr. Hering of bringing the waters of the Upper Lehigh into the Upper Perkiomen, thereby improving the quality and increasing the quantity of the latter. Accordingly in the year 1883 an accurate examination of the Perkiomen valley was instituted; and considering the area of country, the accuracy of the survey, the delicate instruments employed to ascertain the amount of rainfall, the exactness of the gauges which record the number of gallons which flow down the Perkiomen creek daily, all done by parties trained to their work, nothing as complete was ever attempted in this country. Mr. Geo. W. Wood, a resident of the Perkiomen valley, has for the last eleven years made five daily records at Spring Mount station of the amount of water flowing down the Perkiomen creek. He has had under his care for the same number of years a rain gauge which runs by clock-work, and is so delicately constructed that it notes the minute when rain commences and stops and the amount precipitated. If only a dozen drops fall on the instrument it registers it. Even the dewfall affects the instrument. Every morning a clean sheet of paper is placed in the gauge, which if any tracings are found on it, the sheet is sent to the Water Department at Philadelphia, where it is kept on file. These observations are of great scientific value and should not be lost to the world. The area of water-shed of the Upper Perkiomen valley is 152 square miles; its population, 26,000. The average annual rainfall for ten consecutive years ending October 1, 1893, as recorded at Spring Mount station, was over forty-eight inches. 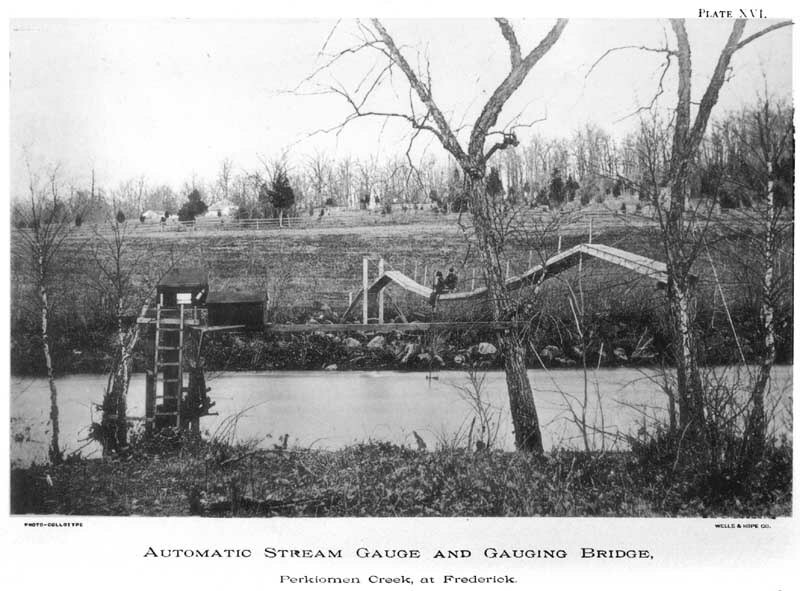 The average daily yield of the Perkiomen creek at the same place for the same number of years was 182,638,369 gallons. An error was found in Mr. Birkinbine's calculations as regards the elevation above [PAGE 11] Philadelphia of the storage dam at Zieglerville, by which it was found that only seven feet of its water would flow into the reservoirs at Philadelphia by gravity. That fact alone stands in the way of its ever being built. If the Perkiomen water will ever be utilized by the city, storage dams will be built at Green Lane and higher up the stream. Should this be done would it be a benefit or otherwise to the people of the valley? The construction of the dam and conduit would require a large force of men and several years of time for their completion.These men would have to be fed and housed and the wages paid them would mostly be left in the places where they were earned. This would be a benefit and a source of profit to those who would supply the wants of the laborers. After the work would be completed the existence of the reservoir would rather be a hinderance [sic] than a benefit. Those living above the reservoir would be hindered in their travels, those below it would live in perpetual dread, real or fanciful, lest the dam should break and they and their possessions should be swept away. In case of freshets, the dams would overflow. The channel of the creek below the dam would be filled and overflowed like before. In cases of prolonged drouth the channels would be dry, vegetable and animal matter would be exposed to the air and sun and thus become causes of paludal fevers. Taking it all in all the people of the Perkiomen valley will be best satisfied to see their main water course flow on unobstructed, in the future as now, to the sea. The Friends of the Schwenkfelder Library & Heritage Center invites the public to a panel discussion at 2:00 pm on Sunday, November 7, 2010 at the Heritage Center, 105 Seminary Street, Pennsburg, on the building of the Suburban Water Company dam in Green Lane. The panel of speakers - Robert Wood, Ed Hildenbrand, John Katrinak, and Donald Moll- will show slides, maps, and discuss the history of what is perhaps the most significant event in the history of the Upper Perkiomen Valley. Folks driving around Pennsburg might assume that the reservoir has always been here. However, its construction is relatively recent having been started in 1955 and finished in 1957, but its history goes back to the 19th century. Briefly, in the late 1800s Philadelphia (like most other cities) had a problem with polluted water sources. Most of the Schuylkill's upstream cities and towns from Conshohocken to Port Clinton more or less disposed of the sewage directly into the river. Also, coal, after it was cracked into small pieces, was covered in a fine coal dust which tended to billow up into a cloud as it was sent down chutes in people's homes. Consequently, coal was washed at the source which sent the dust as a cloudy silt-like pollutant into the Schuylkill and Lehigh Rivers, both of which made their way to Philadelphia. The solution for the city fathers was a plan to gather water from the same source as Philadelphia's ice - the Perkiomen Creek and its tributaries. The plan was never realized, but it never entirely went away. A 1924 clipping from the Ambler Gazette headlines "Philadelphia's water commission have recommended to the mayor the Perkiomen-Tohickon Creek plan...will cost more than $100,000,000." Employing six dams, the general idea was to use aqueducts and pipes to carry 500,000,000 gallons per day from the Perkiomen watershed to the city. The city at that time used 320,000,000 gallons daily. "The Schuylkill would be abandoned as a source of supply as soon as the new plants on the Perkiomen and the aqueducts, tunnels, new service reservoir...can be built." This plan, too, never came to pass as the Torresdale plant was apparently enlarged, and the project went into hibernation. At the end of World War II, as the Philadelphia suburbs mushroomed out into all of lower Montgomery County the issue of water supply re-emerged and planners again cast an eye to the Perkiomen Creek. This time there was to be no reprieve. The plan was simpler: erect one high dam on the Perkiomen and release water into the creek during dry spells - the water would be extracted downstream. Using no public money, but only private venture capital and armed with eminent domain powers, the Philadelphia Suburban Water Company was formed. The site selected was an old ice dam just above Green Lane. The owners of scores of beautiful and historic farms and homes were anguished to learn that their ancestral valley was to be destroyed, and they were powerless to stop it. The historic Knight Road covered bridge and Markley's Mill were doomed. After the reservoir basin was finished in 1957 many residents thought the Perkiomen Creek would never fill it. But fill it did - with 4.4 billion gallons. The surface area is 814 acres and the maximum depth is 66 feet. It has 19 miles of shore line. The Philadelphia Suburban Water Company became Aqua Pennsylvania, and in 1983 sold 1087 acres of land around the reservoir to Montgomery County for a public park. A special showing of documents related to the planning and building of the dam will be offered. This program is free and open to the public. Refreshments will be served. The Schwenkfelder Library & Heritage Center was founded in 1884 as an informal collection in a private home to assure the preservation of the Schwenkfelders' cultural identity. Today the Heritage Center, a not-for-profit organization, is still preserving, interpreting, and documenting the history of this German Protestant group along with the history of the Upper Perkiomen Valley. The Schwenkfelder Library & Heritage Center is open Tuesdays, Wednesdays, and Fridays from 9:00 am to 4:00 pm; Thursdays 9:00 am to 8:00 pm; Saturdays 10:00 am to 3:00 pm; and Sundays 1:00 to 4:00 pm. The Heritage Center is closed to the public on Mondays.